With the arrival of Shetland Telecom's fibre optic cable connection to the SHEFA-2 cable we are pleased to be able to offer ultra high speed connections coupled with massive data capacity. In addition we are also to supply radio connections which enables linking to the fibre optic network without the need for expensive cable installations. The radio system is also suitable for supplying connectivity to locations with poor or no ADSL service. Shetland Broadband has fibre optic connectivity to London data centres and the internet via Shetland Telecom's fibre link to the Faroese Telecom SHEFA2 cable. 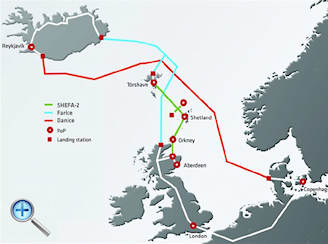 Resilience/redundancy is provided on SHEFA2 via Faroe through the FARICE1, DANICE and CANTAT-3 cables. Direct fibre connection dependant on location of premises. Via a dedicated radio connection, often a more practical and economical solution. Fibre connections are available from 10Mbps to 1Gbps or greater if required. For most locations cable installation will require the laying of a length of cable from your premises to the nearest node on an existing available cable and connection to the network. Once installed there is then an annual charge for data throughput and maintenance. Data throughput can be from 10Mbps to 1Gbps or more, this charge also takes into account contention or any other special requirements. Installation of fibre can be very expensive when there is not a node close by or if one needs to be created so please contact us to see what options are available for your location. For a group of interested parties we may create a node closer to them reducing the cost, then they can have their own individual connection to this node from their premises either by cable or radio. Cat5 connections could also be used over shorter distances (such as an office block). The options for fibre cable connections available are extensive and interested parties should contact us to find their optimal and most cost effective solution. If connections of less than 50Mbps are required then a fibre/radio hybrid connection can provide a more economical solution. Shetland Broadband operates a radio network around the Lerwick area and it is available to those who have line of site to the many radio nodes. This system requires the installation of a small radio box at the premises. Connections are from 10 to 20 Mbps depending on node used however it is hoped that all nodes will soon be upgraded to 25Mbps with maybe higher speeds at some locations.. The uplink speed on this network is from 2 to 4 Mbps depending on option chosen, this offers significant advantages over ADSL, All traffic over this network is connected to the Shetland Telecom fibre network. Linking premises to the fibre cable network by radio provides a more economical solution for high speed connections but id dependant on many variables of up to 350Mbps removing the need for expensive cable laying. Radio connections are feasible for distances of up to 12 miles (line of site required) in a single hop. Line of sight is required between any two points. Topography between locations have to be taken into account such as stretches of open water etc. 25Mps over distances up to 3 miles are possible relatively cheaply using low power radio and 9½ inch antenna. 350Mps can be carried over distances up to 3 miles using state of the art radio equipment. This type of connection is probably the best one for community projects.